JACKSONVILLE, Fla. - Make sure this Valentine's Day is a memorable one by surprising your sweetheart with roses from Arlington Flower Shop, a Jumbo Shrimp hat and ticket vouchers for the 2019 season, all delivered by a Jumbo Shrimp mascot. On February 14, Southpaw and Scampi will personally share the love of Valentine's Day and the upcoming baseball season. 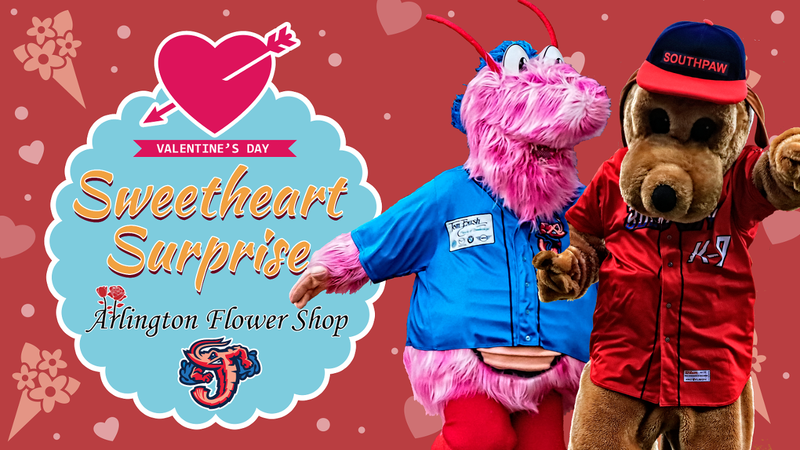 With Cupid's big day right around the corner, Arlington Flower Shop and the Jacksonville Jumbo Shrimp are offering fans the Jumbo Shrimp Sweetheart Surprise, a unique way to make a lasting impression on their loved one. The package includes a half-dozen roses from Arlington Flower Shop, 12 undated reserved ticket vouchers for the 2019 season and a Jumbo Shrimp cap - all for just $100. Loveable Jumbo Shrimp mascots Southpaw and Scampi will deliver the Valentine's Day packages ordered by 5 p.m. on Tuesday, Feb. 12 (or until packages sell out), to their Valentines throughout the greater Jacksonville area. Packages will be delivered on Thursday, Feb. 14, pending availability. Delivery time is limited, so call the Jumbo Shrimp front office at (904) 358-2846 to order packages and schedule delivery.